Here we will review similar works of other authors. Their investigation into the Substance-Accident Structure of things will be briefly evaluated and their progress assessed. After having done so we will know where, in the process, our work picks up the relevant issues again, in order to continue, and more or less conclude, the investigation into this ontological structure. Revising the Substance-Accident Metaphysics -- with emphasis on Substance -- on the basis of new data, mainly provided by Natural Science. It is a thematic (i.e. non-historic) ontological investigation. But, if one would, without (having done a) critical inquiry (about it), stick to the position concerning the ontological status of Man as it is developed in the traditional philosophical and theological systems (in its role as a significant source of inspiration for developing more general ontological considerations), then this abiding in one's cozy traditional home, protected against new ideas, despite one's asserted intention not to investigate the matter solely as a historian, does by definition not belong to my (way of) research. Which means that the many works (having their own values, especially with respect to revealing parts of the history of Philosophy), proceeding exclusively along these traditional lines (purely historical works, but also the alleged -- but not truly -- thematical works), need not be reviewed here. HOENEN, P., 1947, Philosophie der Anorganische Natuur (in Dutch). Van MELSEN, A., 1955, Natuurfilosofie (in Dutch. There is an English edition of this work (not having exactly the same content) : appeared in a 2nd edition in 1954, The Philosophy of Nature, Pittsburgh). Van MELSEN, A., 1964, Evolutie en Wijsbegeerte (in Dutch). We will show some features of these works including their shortcomings (dealing with the latter has proven instructive for our purposes, together of course with some positive results achieved by them). On many occasions they have successfully incorporated modern empirical data into the classical framework of the Substance-Accident Metaphysics. Despite the fact that these works are written in the Dutch language, the reader will have no trouble in understanding the ensuing discussion with respect to them (all citations are translated). SMITH, B., On Substances, Accidents and Universals, In Defence of a Constituent Ontology, Philosophical Papers, 26 (1997), 105--127. It is indeed an investigation into a possible Substance-Accident Metaphysics, but along somewhat different lines as compared with the Aristotelian Metaphysics, but still conserving a certain harmony with that Metaphysics, and obviously inspired by it. It approaches such a metaphysics by studying the relations between parts and the relation of the parts to the whole, from a more or less topological viewpoint, i.e. a mereotopological approach. I have dealt with such an approach (and thereby reviewed the above work) in the Essay A Supplementary Approach : Mereotopology of Reality. This approach turns out to be a complementary approach, complementary to the one I entertain on this website, namely the dynamical systems approach. It is (just) complementary because such a mereotopological approach all by itself is far from sufficient to cover a complete Substance-Accident Metaphysics, while my approach is much more complete, but can nevertheless benefit by including the mereotoplogical approach into the framework of my investigation. All other works about the Substance-Accident Metaphysics and the related problem of individuality are either meant to be historical, and are consequently not dealt with in this Status Quaestionis, or meant to be thematic but give up on any evaluation with respect to relevant new data and ideas provided by Natural Science. Such works also are not dealt with in the present Status Quaestionis. An example of the latter type of works is GRACIA, J., 1988, Individuality : Because GRACIA -- just like the classical authors -- uses almost exclusively the Human Example, and so does not involve any new data and ideas from Natural Science, his conclusions are hardly different from the ones already reached by St Thomas Aquinas in the 13th century, which is -- because of such an approach -- easily predictable in advance, for St Thomas can surely be counted among the most acute thinkers with respect to that Metaphysics. Also all works that approach the Substance-Accident Problem from the analysis of language, or approach it epistemologically (i.e. not ontologically), are not dealt with in this Status Quaestionis. COHEN, J. & STEWART, I., 1995, The Collapse of Chaos, Discovering Simplicity in a Complex World, and STEWART, I., & COHEN, J., 1997, Figments of Reality, The Evolution of the Curious Mind. EMMECHE, C., 1994, The Garden in the Machine, The Emerging Science of Artificial Life. Although this work addresses ontological issues, it does not deal with a Substance-Accident Ontology. In most cases however such works are epistemologically oriented. HOENEN, Van MELSEN and SMITH (As has been stated, this latter work is described elsewhere on this website). In Van MELSEN, Natuurfilosofie, the problem of the ontological status of Man is sidestepped by means of (the trick?) calling the work "Natuurfilosofie" ( = philosophy of nature). Nevertheless it is an excellent book which deals with a number of philosophical classical problems, like the concept of Substance, Individual, etc., and involves some relevant results obtained by Natural Science (as it was around 1955). Besides these results Van MELSEN continually points to some presuppositions implicit in, but indispensible for, Natural Science. One of the conclusions of Van MELSEN is, for example, that to-be-a-subsistent-individual-being (which in my investigation is called a Totality) is gradual, i.e. it is represented in different things in different degrees. He deals with the distinction between a Substance and an aggregate. Further he shows that Quality is not totally reducible to Quantity. Such issues (except the mentioned presuppositions) are also dealt with in the mentioned work of HOENEN, especially those relating to the totality-character of Substances. But before delving into those issues, it is necessary to address the main shortcoming of these works, namely the fact that they, prior to their investigation, already presuppose a divided Reality, with Nature to one side, and Man to the other. This surfaces especially in Van MELSEN, Evolutie en Wijsbegeerte, because there Man is not omitted from consideration. In this work Van MELSEN deals with the theory of evolution (departing) from a philosophical perspective. The relevance of this work for my research is its more or less interdisciplinary nature, Science--Philosophy, and especially its explicit treatment of the status of Man in comparison with that of the remaining organisms. However it is attempted in this work to retain the classical status of Man, even in an evolutionary context. Van MELSEN thus presupposes beforehand the existence of the "immaterial" alongside the material. But this should however be investigated, not presupposed. Further he takes for granted so called "authentic data" with respect to Life, and especially Man, for example the possession of interiority (pp. 85), and the fact that Man is always also subject (in an epistemological sense) of whatever science, also if the latter has Man itself (also) as object (p. 103). The latter authentic datum (p. 103) does however, according to me, not belong to the ontological, but to the epistemological domain, insofar as it concerns the origin, the validity and the range of knowledge, and not (the study of) the physiological process itself of acquiring knowledge. In the latter case Man is object again. The first mentioned authentic datum, the interiority, belongs to the group of authentic data of which the members have denominations like "Life", "Consciousness", "Self-consciousness" and "Freedom". However all these items are, according to me, not primary data (in the sense of, say, necessary presuppositions) but primitive data, i.e. data which in fact each for themselves form a, for the time being, still uncritical summary of large collections of phenomena, accumulated into concepts like LIFE, CONSCIOUSNESS, and others. Unfortunately these concepts (in theoretical discussions) began more or less to lead a life of their own, and are then called "authentic data". It should however be investigated if and to what extent these data are authentic, in some sense of primary. Perhaps they are reducible to other data. Such reducibility is at present indeed being investigated in Natural Science, for example by means of computer simulations (Artificial Life, Artificial Intelligence). However definitive results are not yet obtained. But it is increasingly becoming clear that phenomena like Life and Consciousness are high-level phenomena, as a global result of collective behavior of elements at a local level. The whole passage from those elements (their interactions, and the interactions of their interaction products) to the global behavior is that long (qua number of steps, process stadia) that it appears that the global behavior has nothing to do with the low-level local behavior (as for example the interactions of neurons as local behavior, and thinking as global emergent behavior). This is probably one of the reasons that, for example in Van MELSEN, the status of Man is in fact not analysed because one assumes beforehand that Life and Consciousness are, in one way or another, primary (instead of derived). The analyses relating to lower beings are, with repect to evolution, more or less executed, but, arrived at the phenomenon of Man, they are called a halt to. In my investigation on the other hand these analyses are extended, resulting in a universal Substance-Accident Metaphysics. This will be possible if all specifically human properties turn out to be derived, in virtue of which they do not need to play a role in (i.e. are not constitutive for) a universal Substance-Accident Metaphysics. Of course my (and probably any one) inquiry about the possibly derived nature of those properties will necessarily be very limited. I indeed hope that my research will become a source of inspiration and a point of departure for future work about those specifically human properties, and also about the specific properties of aliveness. "The discussion had, accordingly, to be just concerned with [the question] in what way the spirit-matter relation should be conceived. [Namely] As a spirit which, being in principle independent of the body, was just temporarily present in it, or as spirit which was essentially one with the body." The latter boils down to an idealistic position, which is rejected by Van MELSEN (See Van MELSEN, Natuurfilosofie, pp. 36). "But also if it were established, that only a definite biological structure makes seeing possible, it does not provide knowledge to what seeing really is." Suppose we have a computer program which contains and which can execute all syntactic and semantic rules of Chinese. Does such a program know Chinese? Does this program understand Chinese? The most important point of course is the "all" in "all syntactic and semantic rules". One is inclined to answer, No, the program just executes (its instructions) blindly, without any understanding. It is however worth consideration to assume that a Chinese speaking person also performs the relevant (verbal) actions blindly. Perhaps he indeed performs them blindly and at the same time understands the language. When a computer program, with respect to the foregoing, makes (for us) the impression of clumsiness and rigidity, then this is undoubtedly caused by a case of not, in one way or another, containing all (relevant) rules and contexts (to interpret). "Indeed it is not conceivable in what way the approach of Natural Science could ever demonstrate self-consciousness as derivative of a biological structure. Self-consciousness is by definition the interior self-experience and in no way a phenomenon which is scientifically recordable from without." Such an anticipation whether these phenomena could or could not be understood by Natural Science seems to me illicit and unfounded. Relevant computer simulations seem to point in another direction. Whether these investigations will lead to significant results cannot be stipulated in advance. Nobody can predict the future of science, which turned out all too clear in the case of the development of Quantum Mechanics, where the peculiar role of the observer in a quantum mechanical experiment could never have been predicted, and indeed was never predicted. The same applies to all future developments in computer simulation with respect to the generation of Man-subjective qualia. If phenomena like Life and Consciousness are interpreted as epiphenomena, they are not, because of that, enfeebled -- like Van MELSEN asserts (p. 116) -- but investigated with respect to their generation. "And, as we already wrote down above, no consideration of the doctrine of evolution will benefit from dropping the true distance which the docrine of evolution wants to bridge : Matter [= inorganic things], life, spirit. He who, for example, lets disappear the human singularity, draws a map of the problem in advance." However that which is investigated in the theory of evolution, and in Natural Science anyhow, relates to matter as well as to life and also to consciousness. An unbridgeable gap between these items is not presupposed by it, but that does not mean any denial of the "true distance", nor any forced disappearance of the "human singularity". It knows very well that there are differences between matter, life and consciousness, and it tries to gain insight in whether there indeed is such a distance, and consequently such a human singularity, and if so, how and why. If we assume beforehand that there is a true distance between matter, life and consciousness (spirit), a distance, consequently, in an ontologically fundamental sense, in which we evaluate beforehand the human singularity as something ontologically primary, then we draw a map of the problem in advance. And, as has been said earlier, in this case the investigation is, when it has finally arrived at Man (as a last object of the investigation), or, already when it has arrived at organisms as such, broken off by reason of tradition (not by rational argument), leaving it in a deplorable state. According to Van MELSEN, p. 135, Man is fundamentally different from other beings, especially inorganic beings, in having an activity of his own, and this would only be possible where there is self-knowledge, i.e. where activity is free activity, emanating (originating) from that being itself. Also in this case we encounter notions like "own activity", "self-knowledge" and "free activity", which are not analysed any further. Van MELSEN, does not even ask himself whether these notions each for themselves do have an unambiguous meaning (For acting and speaking in everyday life such questions are of course not needed to be posed). In my investigation on the other hand, some reflection will be devoted to the status of the Self and Free Will in Man. There an unprejudiced start is made concerning an analysis of such notions, in which the possibility of Man existing wholly within the material Nature and having originated from it, is accounted for. Or, in other words, that Man is not distinguished ontologically from the remaining real beings. But also in my investigation definitive results are not to be expected yet. "In it it is indicative that the route to more of interiority and consequently to more of subsistent unity of being, apparently proceeds through greater complexification [of the material configurations]." "Either way, one thing seems to be certain, wherever the breakthrough is taking place, Natural Science will play a decisive part in it.". "Precisely because in the new era we have discovered, as being the characteristic feature of science, its progressivity, we should be cautious to deny a priori possibilities." And thus we should not a priori deny that all non-human higher living beings possess self-consciousness, as Van MELSEN, p. 154, does. In animals like Delphins, Orcas, the teethless whales and the Apes, such a denial is not well-founded. With such a denial, and also because of the status of the earlier more or less humanly looking ancestors of Man, an attempt to isolate Man from the rest of Nature (by attributing to him a special higher and fundamentally different order of being), is very probably doomed to fail. In Van MELSEN, p. 167/9 we read that HOLLAK asserts that the discontinuous transitions (inorganic--organic--spirit) must always be accomplished by a subject which itself already is such a higher entity. This apparently on the basis of the thesis : nihil reducitur de potentia ad actum nisi per ens actu (nothing can be led from potency to act unless by being in act). What is implicitly assumed here is that complexity is something like a conserved quantity, in virtue of which it cannot increase. The study of dynamical systems, however, leads to a different conclusion. Complexity can be generated from simplicity, and also degraded again (taking place within the 'phenotypical' domain of dynamical systems. As I will explain in the course of the investigation, the dynamical law of a dynamical system represent its 'genotypical' domain, while the generated states represent the 'phenotypical' domain of that dynamical system). In the days of works like the one of HOLLAK (1963, See Van MELSEN, p. 168, note 1) complexity-generating dynamical systems did not yet enjoy such a popularity as they do today. They were however known, like the works of TURING and of Von NEUMANN demonstrate. Hence the status quaestionis -- relating to (the study of) the generation of intrinsic Totalities, in the ontogenetic (also in an inorganic sense) as well as in the phylogenetic dimension -- of those days, evaluated in terms of the Substance-Accident Metaphysics, misses this study, the study of complexity-generating dynamical systems. In my investigation they will be dealt with extensively (models, as well as real systems, like the presently intensively studied dissipative systems). These systems have, in virtue of the versatile nature of their chemistry (in the sense of, for example, the superastronomical number of possible combinations, accompanied by the inclination to self-organization of physical matter), an enormous potential, which can develop in different directions everywhere in the Universe resulting in a formidable diversity of designs (Which on Earth is already demonstrated in the 'Cambrian Explosion' ( NOTE 1 )with its many 'experimental' organic designs), making it improbable that Man would represent something like a culmination of development. Being shackled on our planet, somewhere in a corner of the Galaxy (one out of the billions), brings with it a provincialism, which, however, we should try -- albeit speculatively, i.e. with an open mind -- to transcend and put into perspective. The possibilities of -- often disdainfully considered -- (physical) matter are enormous. That is convincingly demonstrated by the study of dynamical systems and of organisms. The present studies of dynamical systems aimed at features of Man, like for instance artificial neural networks, follow, within the framework of Natural Science, a bottom-up approach (which, among other things, means that no functions are explicitly preprogrammed). But this does not imply that, concerning Man, the specific human features are neglected. The investigation into Artificial Intelligence, and also, say, paleontological research concerning Man, prove -- also in 1964 -- the contrary, to which the different sciences of Man can contribute a lot, if only to provisionally specify the object -- Man -- to be investigated, suggesting a direction to take in the bottom-up research (This bottom-up research should study mechanisms (s.l.) that generate high-level phenomena, established and expressed by the sciences of Man, i.e. letting them pop up from the bottom (= lower level), without them having explicitly preprogrammed). If we, as supposed investigators, within the framework of the sciences of Man -- insofar as they are aimed at an insight in Man as such, and not exclusively concerned with the solving of special social and psychological problematic situations -- hold on to the view that Man is "existing freely", "self-present" and "free", then we cannot in fact speak of a genuine investigation -- in the sense just given -- going on in these sciences ( NOTE 2 ), because precisely those intuitive notions should be investigated and analysed. So it is to be investigated not only in what way a term like "existing freely" is de facto used, but also whether it can be de jure used, which boils down to an inquiry what "existing freely" really and primarily means, and should mean. With it one should indicate in what the meaning of this term differs from that of the term "not existing freely". All this should be done in an ontological context. In such an inquiry the possibility of these notions having an illusory nature, in the mentioned context, must be taken into account. Such illusions are of course important for living our daily lives, in fact for our daily survival efforts, and thus having, in such a context, not an illusory nature. The sciences of Man refer to high-level phenomena, and should, according to me, insofar as they are theorizing things, try to integrate themselves with the bottom-up investigations conducted by Natural Science. Only from such an unrestrained integration a suitable concept of Man will emerge, and -- for the benefit of the Substance-Accident Metaphysics -- a suitable concept of a human individual as intrinsic Totality, dynamically connected with its intraspecific and extraspecific environment. In all this the specifically human features will surely not be neglected. One will find out what kind of Substance (in the metaphysical sense) a human being really is, and in what way it differs from the other (kinds) of Substance, as a result of which the development of a wholly unrestricted universal Substance-Accident Metaphysics is (nevertheless) possible. "All in all we would therefore not want to conclude, that a breakthrough in the sciences of Man is not of the greatest significance, nor that the method of the sciences of Man will not show essential differences with those of Natural Science, but [we would want to conclude] that the breakthrough in the sciences of Man will necessarily have to wait for that of Natural Science." "We should afterall always be mindful, that an understanding of the material and vital functions of our mental life presupposes the knowledge of this mental life, especially insofar as its empirical aspects are taken into account." So far so good, as long as the knowledge of this mental life (present in the sciences of Man) is not assessed as knowledge of principles. 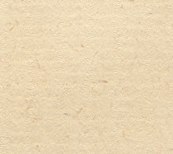 Philosophie der Anorganische Natuur (HOENEN, 1947). In the latter work also all other organisms are not considered, presumably also because of their special status. I will briefly expound some results of these works concerning Substance, followed by an account of some of their findings about Accidents. It is certainly not meant as an extensive review of these works, but a consideration of just some important points, in order to indicate from (about) where my own investigation got started. At the basis of this book lies the Species-Individuum Structure found by Van MELSEN. According to Van MELSEN Natural Science presupposes that every real being always behaves (and because of that is what it is) in accordance with its intrinsic nature, allowing for the method of Induction in Natural Science. The behavior should be exactly repeatable under the same conditions (i.e. repeatable from one individual case to another), resulting in the possibility of a generalization of, say, a conclusion from a certain experiment. If this were not the case, then (to do) Natural Science would be impossible. In accordance with this, material beings must, each for themselves, consist of two fundamental entities ('parts') : A individuum-part and a species-part (These are not parts in the usual sense, but something like principles, making up a thing, i.e. causing something to be a thing at all). Van MELSEN, does not consider the, at least logical, possibility that such a repetition could be, in all cases, less exact (in reality), but nevertheless remaining wholly within the margins of uncertainty of the scientific observation methods, resulting first of all in the fact that such deviations of exact repetitions would not be detected, and secondly that (to do) Natural Science would still be possible, because induction itself is still possible. This Species-Individuum Structure, in virtue of which every real being can -- exactly --repeat itself specifically in many individual cases, is by Van MELSEN directly related to the Form-Matter Structure of the Aristotelian metaphysics. In my investigation I will often refer to this Species-Individuum Structure of every real being. "The distance between both aforementioned cases of unities can gradually be bridged by things like a lump of earth, a piece of cement, a brick, and several crystals melted together. It is difficult to see, where the accidental unity (illustrated by a heap of stones) ends, and where something like a substantial unity (illustrated by a crystal) begins." Also the distinction between the chemical bond and physical adhesion presently, as he says, turns out not to be a sharp distinction, because, firstly, there are intermediate forms between these two, and, which is even more important, because recent Natural Science reduces the forces of chemical bonding finally to physical forces. So there is no essential difference anymore. Van MELSEN discusses all this in the context of the opposition between Mechanicism and Hylemorphism ( = the aristotelian holistic conception of real beings, in terms of his Matter-Form Structure of things). According to Mechanicism there are things like ultimate particles, which differ little from each other, particles which, each for themselves are already complete material things. These particles are permanent. Larger wholes just consist of all kinds of configurations of those particles. This mechanicistic atomism can indeed account for random aggregates, but not for the clear presence in Nature of tendencies to form constant patterns. To be able to account for this, too little qualitative properties are attributed to these particles, and moreover they are unchangeable. For true versatile pattern formation to be possible, the particles (the elements of a system) should possess assimilation properties, by which they -- changed in the process -- can enter the larger newly generated whole (the -- new -- pattern). Immediately connected with the generation of constant patterns is the formation of true individuals. Van MELSEN discusses them from p. 166. "The fact that an increasing uncertainty appears when descending [along] the line from higher animals to non-living things, can also be an indication that the concept of individual is losing little by little its meaning. It is perfectly imaginable, that nature itself attributes to the formula : 'natural cohesion in time and space' a gradually decreasing meaning. Not without reason is 'natural' derived from nature." "At the level of being-a-human, and also still at that of the higher animals, nature shows such natural cohesions, that to-be-an-individual at these levels indeed means something. The natural coherence of the parts is caused by a nature (human, or animal species), which is totally directed to give the individually existing being a clear individuality, an individuality with a clearly expressed pattern of organization, characterizing the individual concerned as an individual of a definite species. We encounter something like self-sustenance of the whole, to which all parts are subordinated. [...] In lower animals and plants we can still find something of this marked individuality, but indeed in a much more low-level way. [...] In non-living material we still find, to be sure, natural cohesion in time and space, but it seems as if nature is no longer interested anymore in keeping a certain organizational pattern pure, nor in mutually separating individuals." This theme is worked out further in my investigation. The problems of the phenomenon of being-a-Totality, thus of being intrinsically one, possessing one Essence, and the problem of that Essence being individuated, can come closer to a solution if we assess them in the context of (Totality-generating) dynamical systems. They are however not explicitly dealt with by Van MELSEN. Having briefly reviewed the phenomenon of being a Substance according to Van MELSEN, we will now turn to his view about some Accidents, namely Quantity and Quality. "The concept of quantity is one of our very first and most fundamental concepts, therefore it is impossible to give a strict definition of it." Within it we can distinguish between discrete and continuous Quantity. Quantity is described by Van MELSEN as number, as space, as motion and as time. Such a general inquiry concerning Quantity I did not undertake, because in my investigation the individual Totality, the intrinsically determined thing, is central. In it Quantity is one of the determinations of such a Totality. Such quantitative determinations are of course closely related to, first of all, space, i.e. the spatial. "Although we must undoubtedly speak of a certain reduction of the qualitative to the quantitative taking place in Natural Science, it would be incorrect to immediately decide that it concerns a complete reduction. So differences in color are indeed expressed in Natural Science by means of differences in the value of certain physical magnitudes, like wavelength and amplitude, but this does not imply, that it concerns purely quantitative magnitudes. After all, the magnitudes, which figure in the formulas, by which the colors and their properties are represented, are not purely mathematical entities. They refer explicitly to certain material dispositions." "If we use the term 'quantitative' in a strict sense, then it is immediately clear, that in an exclusively quantitative material world not any observation or measurement is possible. [...] Observation and measurement thus require qualitative differences, because they at least require a difference in intensity of a certain quality, and also this is a qualitative difference. It follows that Natural Science, as being an empirical science, presupposes that material entities are more than pure quantity. An empirical science presupposes in material entities a factor, which makes the quantitative relations observable, and it is this factor, which we call the qualitative." "The Accident is nothing else than a further determination of Substance. Therefore the duality in the domain of the substantial must also be extended into the domain of the accidental. In this latter domain the duality becomes knowable as the distintion between quantity and quality. The distinction is real, but it does not mean a separation, just as little as the distinction between matter and form means a separation. Quantity and quality thus are united as intimately as possible." The philosophy, as presented here by Van MELSEN concerning the material world, is a theory of Being. It deals with the way of being of things and events, of space, time, quantity, quality, etc. They are studied here insofar as they are contained in the presuppositions of Natural Science. These presuppositions tell us something about the fundamental ontological principles of observable reality. In the next work, to be reviewed briefly, namely Philosophie der Anorganische Natuur by HOENEN, 1947, the ways of being (of things, and of their determinations), dealt with by Classical Metaphysics, are considered too, but this time in the context of the results (in contrast with presuppositions) of Natural Science. It is attempted to consider these scientific results as specifications of the Aristotelian-Thomistic Metaphysics, or, in other words, it is attemted to demonstrate that the Aristotelian-Thomistic Substance-Accident Metaphysics is still valid in the light of modern (1947) data from Natural Science. The consideration limits itself however to inorganic beings. For our purposes most important is his exposition of intrinsic Totalities as (or recognizable by) totality-resultants of certain mixta (for example chemical compounds) in contradistinction to aggregation-resultants of other mixta yet again. Very significant is the way of being of the elements in those mixta. The discussion in HOENEN boils down to -- what we nowadays would call -- a reductionism-holism discussion. If there exist true macroscopic Substances, in the sense of intrinsic Totalities, then, according to Classical Metaphysics, it follows that they, each for themselves, always possess only one substantial form. This implies that the elements, composing such a Totality, cannot be present actually, because then there would be more than one (differing specifically) substantial form. So, a crystal of common salt for example, which is composed of the chemical elements Sodium and Chlorine, would at least possess two substantial forms. HOENEN attempts to solve this problem by demonstrating that the elements in such a "mixtum perfectum" are only virtually (i.e. in a near potency) present. All this of course runs into trouble when relevant data from Natural Science are involved (in the investigation). HOENEN discusses them meticulously. "We saw however [...] that unity of substance does not exclude multiplicity of accidents, hence of qualities. We also saw that unity of the [spatially] extended substance does not prohibit diversity of qualities in different parts of that substance, hence allowing for the possibility of heterogeneity in one continuum." One Substance can carry several accidents, and especially differently localized ones (in the Substance), and hence can be heterogenous. In this context not all forms of heterogeneity are important : HOENEN asks himself (p. 334) whether there exists permanent heterogeneity in physical continua, which is characteristic for the species, thus being a property in the strict sense of the word. Its possibility is established (A Substance can have several Accidents, among which also permanent ones), its factual existence should be decided by experience. "This heterogeneity is for this reason important, because it can be related to the conservation of properties of the elements in a mixtum. It thus can provide a further specification of this conservation and in virtue of that of the relationships between elements and mixta. It will have to be called a "structure" in the full sense of the word.". HOENEN tries to demonstrate that the heterogeneity in, for example, crystals -- there displaying a reticular pattern -- found on the basis of scientific investigations, can be explained without assumption of the presence of actual particles in the crystal. So it would be a distribution of qualities, across one substance, instead of a distribution of particles (See p. 381/3). However this is not just like that confirmed by present day science. One even was able to observe -- with the aid of so called tunneling microscopes -- the particles (in which of course the interpretation of such subtle methods plays a role). While HOENEN views the heterogeneity in a crystal as a heterogeneity in quality (qualities), for instance the local densities, and consequently just a heterogeneity in an accidental sense, modern Natural Science views this heterogeneity nevertheless as actually existing particles in the crystal. We can watch particles (here molecules), made visible, for example in Plate 2 in BALL, P., 1996, Designing the Molecular World. (Click HERE to see it.). On that plate we see a layer of C60 molecules ( i.e. a chemical compound consisting of 60 Carbon atoms, arranged to form a 'soccer ball'. For the structure of a single molecule, see Figure 1. ) deposited on a surface of gold. The photograph is made by a scanning tunneling microscope. The spherical molecules appear as bright peaks. Their hexagonal and pentagonal rings (representing the soccer ball structure), in which the atoms unite to form the spherical molecules, cannot be made visible because the C60 molecules appear to perform fast spinning movements. Also these movements point to an actual presence of these molecules. Whether the regular arrangement of the C60 molecules (not to be confused with the regular arrangement -- namely by means of the aforementioned rings -- of the sixty atoms in such a molecule) in the aforementioned Plate reflects the intrinsic ordering of a partial C60 crystal-structure, or just the one of the gold substrate, cannot be decided from that Plate, but, one has succeeded in obtaining complete CRYSTALS of C60 from a solution of it in Benzene (To see them click HERE). By means of the X-ray diffraction technique one could establish that these crystals consist of stacked layers of spherical molecules, with their centers separated about a nanometer ( = one thousand-millionth meter) from each other. This was precisely to be expected for the regular ordering of assumed C60 balls, i.e. 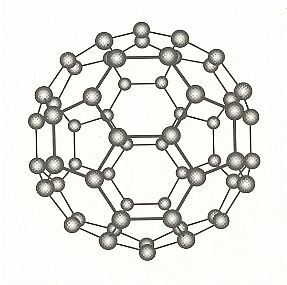 that a C60 molecule is a regular spherical cage, consisting of 60 C-atoms (BALL, p. 49). Figure 1. Structure of a C60 molecule. It is a sixty-carbon-atom cluster, called buckminsterfullerene. After BALL, P., 1994, Designing the Molecular World. The point is that molecules (even fairly small ones, like C60) can be made visible. But even if the visible ordering of the molecules were indeed the image of the C60 crystal lattice, these observations could still be explained along the lines of HOENEN's theory : The crystal lattice then is according to this theory not a distribution (ordering) of molecules (as actual components of the crystal), but of qualities of the C60 crystal. This regular (reticular) distribution of the intensity of one or another quality, or such a (reticular) distribution of several qualities replacing each other (i.e. replacing each other while we look from place to place inside the crystal), could be the cause of the fact that the employed instrument reacts the way it does, or, differently expressed, the instrument records this distribution of qualities across the crystal (now considered as being a continuum). The C60 molecule is synthesized by Man, in fact designed. In this context it is still difficult to imagine that they become virtual as soon as they are included into a crystal framework. Likewise it is hard to imagine that the 60 carbon atoms would become virtual as soon as they are synthesized into a C60 molecule. The insistence on the continuous nature of molecules and crystals by HOENEN looks a little forced (but surely interesting). Nevertheless we can, for the time being, accept the following conclusion of HOENEN : The assumption of actual components in a mixtum perfectum is superfluous in order to explain all kinds of phenomena, like X-ray diffraction in crystals. This, of course, does not deny the assumption being correct. But whether we have just qualities, or particles, we now have in crystals an instance of a permanent and specific heterogeneity. HOENEN, p. 386, reminds us about some ancient ideas concerning the generation of the mixtum, referring to the philosopher Fr. Toledo S.J., who, immediately after the Middle Ages described the general opinion of the Medievals. "We heard from Toledo, in what way Aristotelian medievals already correctly imagined the generation of a mixtum : the elements are divided into their minima, these come to lie next to one another, then the minima of one [substance] act on those of the other and they change each others qualities. The resulting properties will be specific for the compound, then originating. [...] minima of the mixtum originate, which each for themselves satisfy the requirements of the principle of heterogeneity. Namely in this way : the properties of the periphery of the atoms will have been changed, those of the more central parts, more probable those of the nucleus, will have been changed in a lesser degree, or possibly even not changed at all. And this heterogenous complex then is, as expressed by the medievals, the "typical", i.e. the specific "disposition" for the minimum of the compound, which disposition is conserved in the compound. [...] So we find a more detailed elaboration of the principle of heterogeneity. While this in general teached us the heterogenous virtual conservation of properties of the elements, we now discover the heterogenous virtual conservation of individual properties of atoms. In this way we arrive at the concept of virtual atoms [ NOTE 3 ] in the continuous molecule of the mixtum. This will have a heterogenous structure in conformity with virtual atoms. If there does not originate one single molecule, but a macroscopic mass of a compound, a crystal, then this will, also when it is continuous, have to carry a periodic heterogeneity with virtual atoms. [...] In what way precisely this periodicity is structured, will have to be decided by experience. Well then, for crystals experience [...] tells us the following : that periodic heterogenous structure is in crystals a reticular symmetric one. [...] Also the results of this theory [the atomic theory] leave our problem still unsolved. Both systems that we investigated [the atomistic and the Aristotelian], still can account for the structure of crystals : the atomistic, subject to its finding the forces, which cause the structure as equilibrium. The requirements imposed on such forces, have become more weighty." "After all, if the properties of the components, from which their interaction originates, are given, one will be able to calculate (unless mathematical complications cause the calculation to be too difficult), which new, truly constitutive, properties follow from their combination. [...] If the calculated properties are indeed those, which the combination actually has, then we have proof that the combination is a pure aggregate of these components. If, on the other hand, the combination does not have those properties, but other ones instead, then we also have proof that it is not an aggregate, that the resulting property is subject to a higher unity, than that of an aggregate, to that of one substance, of a totality. And then we have a new property in a double sense : firstly [...] in this [sense], that the property was not present in the individual components, and could not be there [...]. Secondly in this more decisive sense, that it is also another one, than the one which would result from a combination of the same components, which is a pure aggregate [i.e. when we had a case of the combination -- of the same components -- in such a way that it now was a pure aggregate]. A new property in the first sense alone, we will call an aggregation-resultant, a new property, new, also in the second sense, [we will call] a totality-resultant. [...] Here we have discovered a true totality-criterium." As soon as we have to do with totality-resultants, this means that one or more properties of the mixtum are not derivable from those of the elements, implying that also the mixtum cannot be reduced to those elements, and consequently that mixtum really being a new Substance (a new Totality) with a substantial form of its own. However we should ask ourselves the question whether such totality-resultants, as defined by HOENEN, really exist, because a calculation of such a property that does, with respect to its result, not correspond to the observed property could also be the result of an insufficient or incorrect mathematical procedure or approach, rather than a reflection of the property being really and truly new, and not in anyway reducible to the properties of the components. The atom, according to Quantum Mechanics ( = the non-classical physics), turns out not to be interpretable as a system of moving parts -- thus not interpretable as being purely mechanical. But contrary to what HOENEN asserts, the absence of this purely mechanical nature does not imply that such an atom, say, the Hydrogen atom, is necesarily a continuum (in which, consequently, the components can only be present virtually). HOENEN views the system of spectral lines of Hydrogen, which should be explained by Quantum Mechanics, as a totality-resultant (p. 416). It is plausible that, on the basis of its system of spectral lines, a Hydrogen atom is a unity, but such a unity does not necessarily have to be a continuum, it could, according to me, very well be one or another tight contiguum, in the form of a certain kind of dynamical system (of actual elements of whatever appearance). Such a dynamical system consists of an ongoing, or already accomplished, interaction of elements, and consequently such a system consists of actual elements, not virtual ones ( NOTE 4 ). The unity is determined by the one dynamical law to which the elements are subjected (and which is inherent in those elements). Moreover, in order to actually generate an intrinsic Totality, and also in order to BE an intrinsic Totality (i.e. in order to be an intrinsic Totality in the form of a Substance), an intrinsic boundary (interface with the environment) is required. In order to be a Totality, it is, according to me, not necessary that its elements are only virtually present. Nevertheless I would like to keep this possibility (of the elements being virtual) open to further investigation. Regarding chemical compounds HOENEN demonstrates that scientific results concerning the optic and X-ray spectrum are not contradicting the Aristotelian view that chemical compounds are continua : some properties of the elements must, also according to this view, be conserved, because of the chemical kinship of those elements and the resulting compound. This in virtue of the fact that this compound always and only (finally) results from precisely those very elements. The X-ray experiment satisfies all this. But still this only implies that the continuum hypothesis of the Aristotelian theory is not contradicting scientific results. But the other view, namely that the elements (here atoms) keep actually existing in the mixtum (here the molecule or crystal) is also in accordance with those scientific results. The only result of this whole consideration is again that also the chemical bonding does not proceed along purely mechanistic lines. The same considerations apply to the phenomena of radioactivity (HOENEN deals with them from p. 429). Also in this case both views are in accordance with the relevant scientific results. So we still must make a choice concerning those views. Human individuals are, according to him, true Substances, genuine intrinsic Totalities. Hence macroscopic Totalities do exist. Therefore there is no a priori reason anymore to attribute "being-a-Totality" exclusively to submicroscopic entities, like elementary particles (for instance elecrons, protons). Molecules and crystals can also be Totalities. But if we assume that their elements are actually present, then such a Totality would have several substantial forms. Said differently, if a molecule or a crystal is an aggregate of several Substances, then it is not one Totality, and then surely a human individual is not a Totality, for a human being consists of many (loosely connected) molecules (and would be an aggegate of aggregates). Hence HOENEN declares the conserved (properties of) elements to be conserved qualities. And qualities are Accidents, by which the multiplicity becomes just a multiplicity in an accidental sense, not in a substantial sense. According to me this desperate move to virtual elements, is, as has been said, probably not necessary. Totalities can be viewed in terms of (Totality-generating) dynamical systems, and keep conserving their intrinsic totality character, despite the actuality of the parts of such a Totality. As already pointed to in NOTE 4, we should be a little cautious in these matters. The unity of a substantial being is, in my new interpretation, on the basis of dynamical systems, indeed already garanteed by its being ruled under ONE dynamical law, i.e. I am shifting this unity from the 'phenotypical' to the 'genotypical' domain, which means to that law. Accordingly we could state that, although it concerns ONE dynamical law, its product, the generated being, need not necessarily be ONE : The elements are, on the basis of that one dynamical law, being organized into one or another pattern which is a configuration of actually existing parts. This interpretation of the product I would like to call a physical interpretation, and as such a correct interpretation (something that HOENEN -- in his book -- is going to deny on the basis of not too strong an agument). But also a metaphysical interpretation is possible, which is not contradicting relevant scientific data (this is convincingly demonstrated by HOENEN). The parts, the elements, of a Totality are not things, but properties, determinations, qualities, of the Totality concerned, of the mixtum (perfectum). The elements exist only virtually in the mixtum (waiting as it were to be actualized again, when the Totality disintegrates). We could pose that this recovered unity of the thing, its being a Totality, is the EFFECT of the unity of the dynamical law. A treatment in terms of dynamical systems, with their initial conditions, attractors, perturbations and dynamical laws is almost absent in HOENEN. By understandable reasons by the way, because only recently the dynamical systems and their relation to the generation of Totalities (for instance organisms) are in the very footlight of scientific research (Dissipative Systems, Artificial Life, Complexity Theory). With their help one could fully experience the self-organizational capacity of physical matter. In addition to Totalities, Substances, HOENEN also analyses some Accidents in the light of scientific data, so, among other things, regarding Quality, pp. 195. But because in my investigation the Totality is so central, I will not deal with HOENEN's analyses of Accidents, in order not to make this STATUS QUAESTIONIS too long. In my investigation I treat of Accidents more generally, as being determinations of the Totality and belonging to the 'phenotypical' domain (while the Essence, the dynamical law, is situated in the 'genotypical' domain). As turns out in this STATUS QUAESTIONIS, not very much literature, relevant to my research, exists, indicating that the investigation (and approach) is fairly new. I hope that this STATUS QUAESTIONIS has contributed something in giving the reader some idea about the nature of the problem and the condition in which I found it before I started it.